The Waldo County Street Maps from Timestream® offer accurate street naming information for every town in the county. 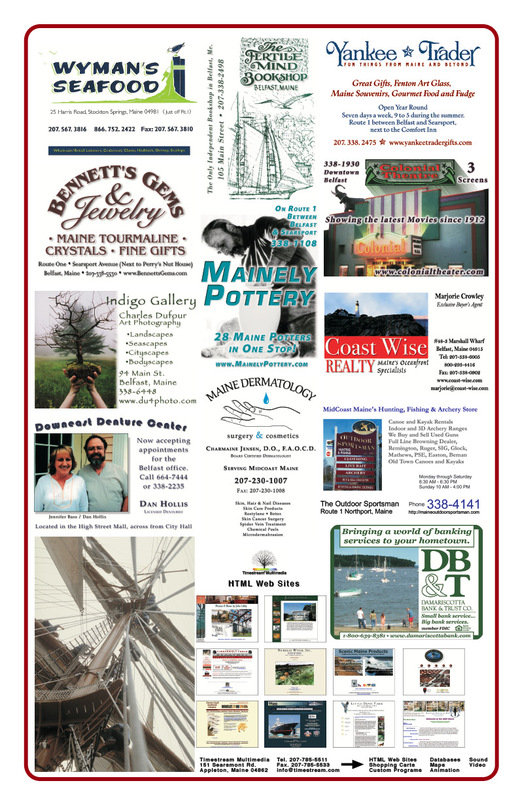 The maps are formatted as a 68MB high-resolution PDF file (300dpi), printable as a complete 28-page book in 11" x 17" format or tiled and printed using Adobe Acrobat on 8.5" x 11" landscape pages. Detailed areas from these maps may be selected and printed separately using free Adobe Acrobat Reader software. Road and street names are printed in large bold type so the maps can be as small and handy as possible but still be easily read. 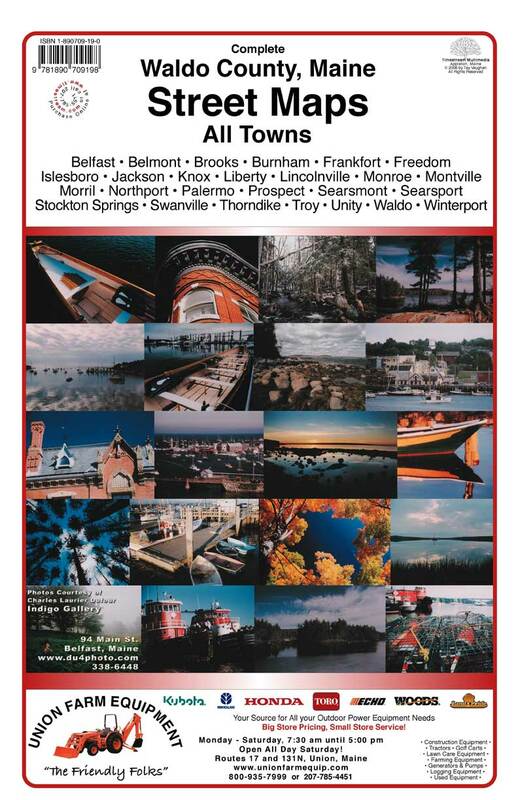 Where streets are tight together, as in Rockland, Camden, and Thomaston, detailed enlargements are included. 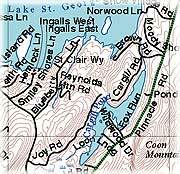 Contour lines and water features such as rivers and marshes are taken from USGS data. We included cemeteries, power transmission lines, and railroads. Each town's map also includes a key for looking up its roads. 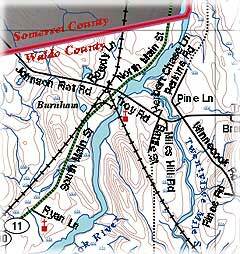 We felt this was particularly important because many roads in Waldo County have only recenty been named, and even people "born and raised" in a town may not know where a "new" street is. 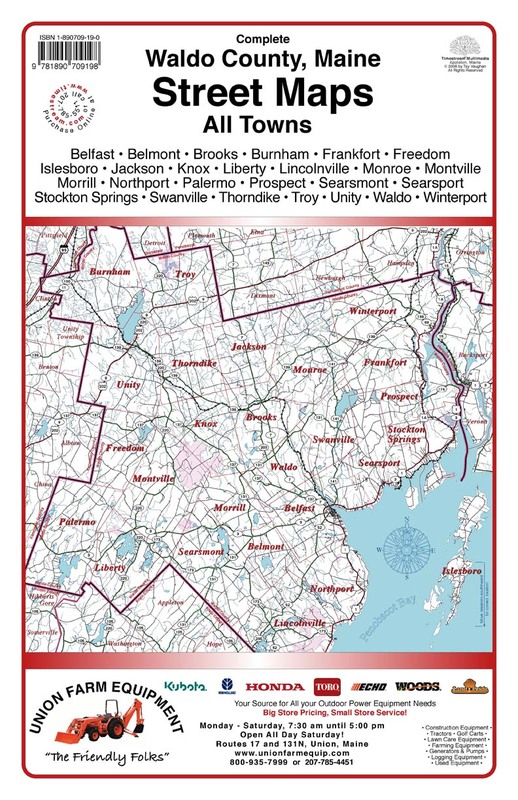 In 1988, voters in the state of Maine approved a referendum to create an enhanced 9-1-1 system (e911) to ensure reliable caller information and improve dispatch of emergency services to readily identifiable locations. The plan required towns with rural route mailing addresses to convert them to city-style addresses (street names with numbers), and each town appointed a Municipal Addressing Officer to oversee the work of organizing the street names in his or her town and coordinating key players - residents, the town, the telephone company, and local Post Offices. Writing street names along highways, roads, streets, lanes, alleyways, and paths on giant maps has been an arduous task for each town's Municipal Addressing Officer. Sometimes naming streets in Waldo County became hotly emotional and political. 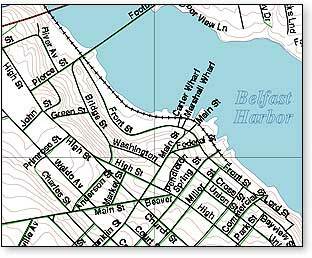 The final street names on these working maps were then sent to the State of Maine's geographical information system office, where they were digitized and added to Maine's GIS database. Copyright © 2004-2019 by Tay Vaughan. All Rights Reserved.